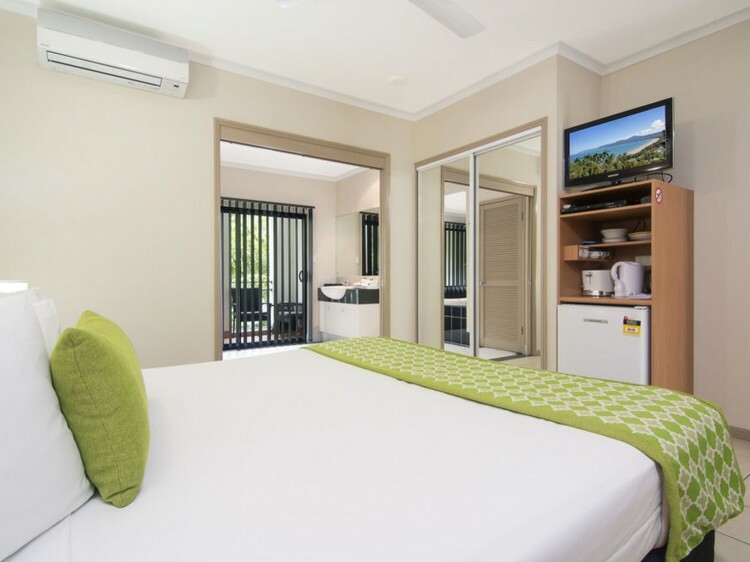 Regal Port Douglas is perfectly located right at the start of the restaurant strip in Port Douglas but at the quieter end of Macrossan St, only a short stroll to Four Mile Beach, Marina Mirage and Sunday markets. The resort offers 1 and 2 bedroom apartments all with balconies and either outdoor Jacuzzis or indoor spa baths. With stair access to all levels, each apartment is fully equipped and self contained including laundry facilities. 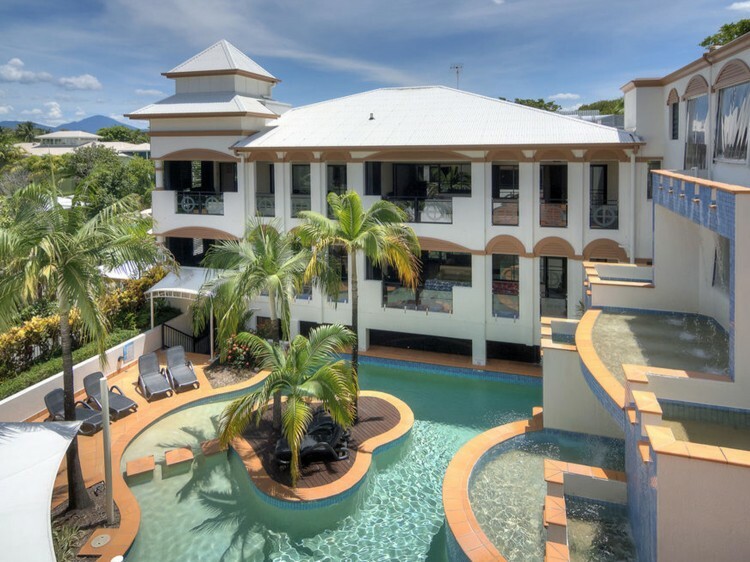 Regal Port Douglas features a variety of resort facilities including a heated swimming pool and spa area complete with sun lounges, barbecue, table and chairs. The airconditioned transit lounge is perfect for relaxing with a good book from the library and keeping in touch with complimentary internet. Free WiFi is also available in the foyer and public areas. With balmy days and tropical evenings you will enjoy the selection on offer for dining in Macrossan Street, or watch the sunset over the inlet with a bucket of prawns. Please note: access to all apartments and studios is via stairs. Located on foyer level, 1st and 2nd floors with a king bed or 2 singles (request only), airconditioning, ceiling fans, tea / coffee and toaster facilities only, bar fridge, TV/DVD with cable channels, spa bath in bathroom and balcony. Shared laundry is available in garage for Studio unit guests. 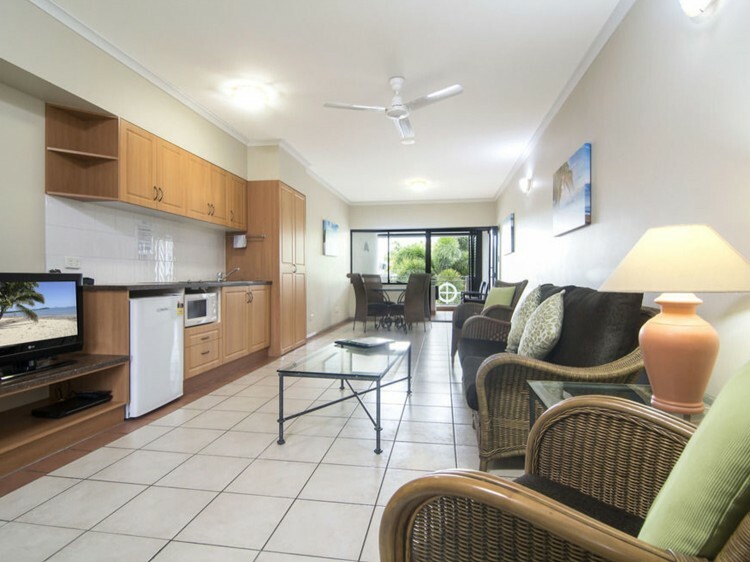 Situated on 1st or 2nd floors with either an outlook over Macrossan Street or the pool. Totally self-contained with a king bed or 2 singles (request only) and a sofa bed for a 3rd person, airconditioning, ceiling fans, a well equipped kitchenette, TV/DVD with cable channels, washing machine and dryer, spa bath in bathroom and balcony. Situated on foyer, 1st or 2nd floors with either an outlook over Macrossan Street or the pool. Totally self-contained with a king bed or 2 singles (request only) and a sofa bed for a 3rd person, airconditioning, ceiling fans, a well equipped kitchenette, TV/DVD with cable channels, washing machine and dryer and balcony with outdoor Jacuzzi. There are two luxurious self contained Rooftop Apartments, both with their own huge private rooftop courtyards, private Jacuzzis, BBQ and entertainment area under shade sails. Totally self-contained with a king bed, airconditioning, ceiling fans, a well equipped kitchenette, TV/DVD with cable channels, washing machine and dryer and balcony with outdoor Jacuzzi. This apartment is not suitable for children or infants. Suitable for a family holiday or for 2 couples, these apartments are located on foyer level, 1st and 2nd floors and sleep up to 4 persons with the availability of a rollaway for a 5th person. Bedding consists of 2 king beds or 1 king and 2 singles, a well equipped kitchenette for self catering, washing machine, dryer, airconditioning, ceiling fans, 2 TV/DVD with cable channels, spa bath and balcony with outdoor Jacuzzi.